Unicorn Quest needs to be hard for two main reasons. To lengthen playtime and feel like a genuine arcade style shooter. But losing can be frustrating if it doesn't feel right. One thing I noticed about myself when playing things like Trials or Flappy Bird is that a quick redo makes the whole thing less painful and more like "Just one more time." and I'd rather have players quickly resetting battles when they lose than going all the way back to a checkpoint and losing items, experience, etc. 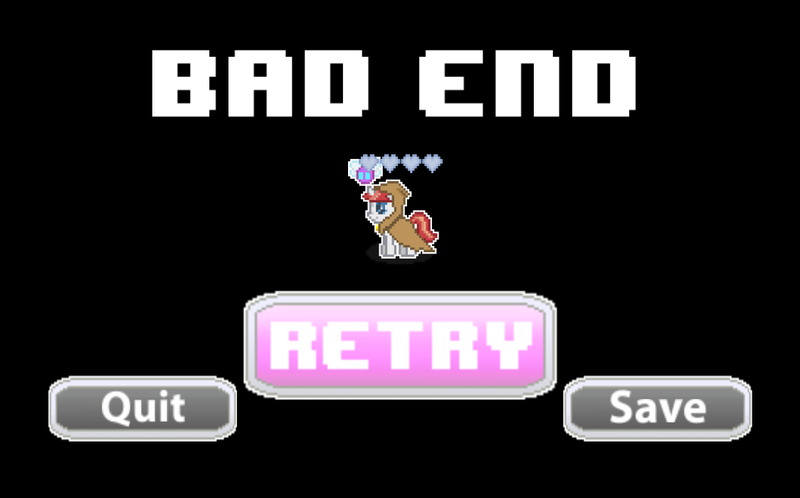 In Unicorn Quest, if you lose all your hearts you can just reset the fight or exit to the entrance of the overworld room where the fight started. No penalties. If you die in the overworld (traps, lava pits, etc.) you reset to that rooms entrance as if walking in for the first time, but without losing items. Chests you opened will stay open and beaten enemies won't respawn. When you beat a boss, it'll be a hard battle that you came out on top of. You tried and failed, switched strategies and won. I want players to feel good about themselves when beating enemies, not just plowing through an easy game in a couple of days. Now I just have to finish up death animations.